Manufactured from strong, long wearing and durable black 600 Denier fabric to offer the best protection from harmful elements. This cover is nearly bulletproof! 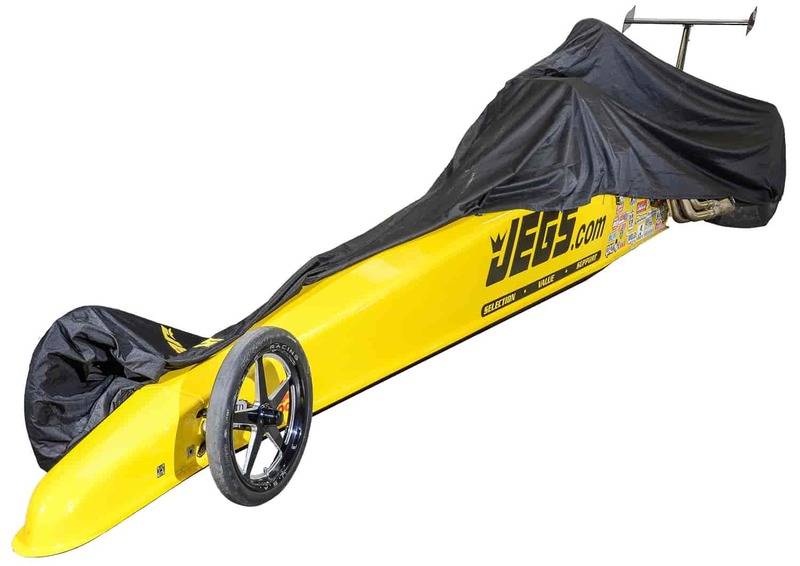 Designed for 215" - 240" wheelbase dragsters without a rear wing This cover features sewn in straps and buckles for easy installation and maximum retention. Includes a handy storage bag. 90010 is rated 5.0 out of 5 by 1. Rated 5 out of 5 by Duston Wurtz from Best bang for the buck out there Bought this for my son's Dragster. Fits perfectly. Nice quality. Does it have a protective inner liner to keep from scratching paint? No, the cover itself is soft any will not scratch most painted surfaces. Is it long enough to fit a 242&rdquo; wheel base dragster? This cover will fit the 235&quot; wheelbase, but does not have a provision for a wing. Is this cover Waterproof/Water Repellant or just Water Resistant? This is water repellent/ water resistant. This cover will work, however, it will be a little long on the 200&quot; wheelbase.